Whatâ€™s happening in public health across the island? The response to the call for proposals for the IPH Open Conference was fantastic with 96 top quality abstracts being submitted. The top 24 with the most votes form the conference programme (available below). An excellent variety of public health topics will be discussed including: childrenâ€™s issues, food initiatives, obesity, mental health, menâ€™s health, national public health policy â€“ something of interest for everyone. Injuries are a major public health concern and responsible for substantial mortality, disability and reduced quality of life. Comparisons of injury incidence between countries help us understand how injury occurrence may vary with national policies and environments. In partnership with the Injury Observatory for Britain and Ireland (IOBI), IPH is comparing the rate, causes and intent of hospital admissions for serious injury in the Republic of Ireland, Northern Ireland, England, Scotland and Wales. The findings will be published by the end of 2013. Email Steve Barron or call +353 (01) 478 6313. An IPH report comparing the socio-demographic pattern of food poverty risk between Northern Ireland (Living Costs and Food Survey 2009) and the Republic of Ireland (Household Budget Survey 2010/2011) will be launched in November 2013. The report will also look at trends in the risk of food poverty in the Republic of Ireland between 2004/05 and 2010/11. For more information email Kevin Balanda or call +353 (01) 4786300. Breastfeeding is an important factor to giving a child the best start in life and is central to fostering optimal health and development in the early years and helps contribute to reducing health inequalities. Evidence suggests that low breastfeeding rates are a problem across the island of Ireland. IPH is supporting the Health Service Executive by conducting a review and evaluation of Breastfeeding in Ireland â€“ a Five Year Strategic Action Plan. Breastfeeding â€“ A great start: A Strategy for Northern Ireland 2013-2023 was launched in June. 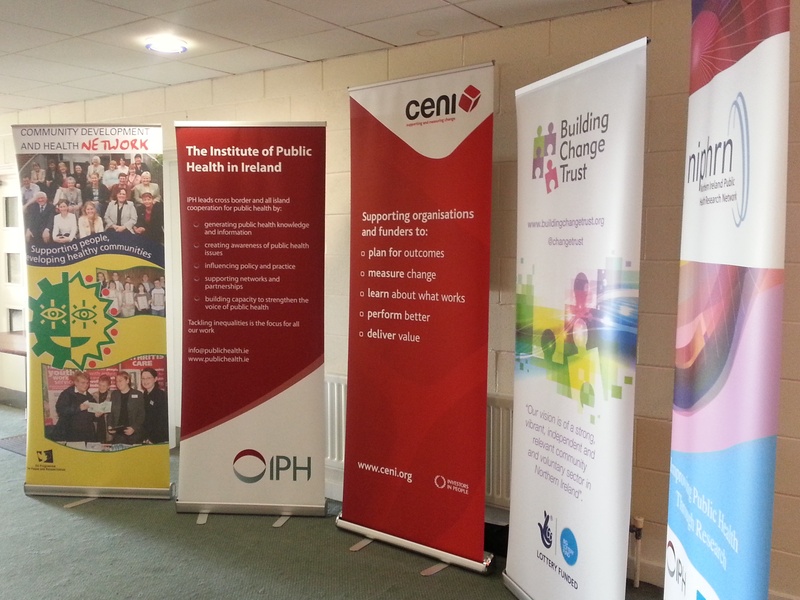 A workshop co-hosted by the Institute of Public Health (IPH), Community Development and Health Network (CDHN) and Community Evaluation Northern Ireland (CENI) was held in Belfast on 5 September 2013. The workshop provided an opportunity to discuss the role of the community and voluntary sector, and to begin planning for the support it needs to participate in research and evaluation in Northern Ireland. The PANI Tool aims to promote awareness of physical activity and nutrition activities taking place across Ireland, Northern Ireland and Britain. IPH is currently updating the Physical Activity and Nutrition Interventions (PANI) Tool. If you currently have an intervention on the PANI Tool you can expect to hear from us shortly to update these details. If you would like to include your intervention on PANI Tool complete our questionnaire. For more information email Fiona Oâ€™Shea or call +353 (01) 478 6316. A new theme Adolescence and Early Adulthood containing data about adolescents aged 13-19 years has been created on the Community Profiles Tool on the Health Well website. This is the third theme in a suite of health-related indicators such as transport to school, early school leavers, and teen birth rates. Other data themes relate to Early Years and Middle Childhood. For more information email Loraine Fahy or call +353 (01) 478 6305. IPH is pleased to welcome the Children's Research Network, Healthy Food for All and RIAN (Ireland's Open Access Research Repository) to our growing list of partners and will be making their resources available via our websites. In addition, the Health Well and Hubs have recently benefited from a new layout and design that aims to make it easier and quicker to get to its wide range of resources and tools. IPH is an all-island organisation which supports cooperation for public health on the island of Ireland. IPH websites and twitter accounts share information, policy developments and public health news from across the island. We welcome any feedback, comments or suggestions you have on improving how we do this. This HRB Centre for Health and Diet Research Conference addresses the importance and challenges of evidence-based public health policy. IPH Research Analyst, Steve Barron will present on â€˜Estimating the prevalence of chronic disease in Ireland with sparse dataâ€™ in a session chaired by IPH Director, Owen Metcalfe. Open Access (OA) is the immediate, freely available, online access to research outputs. These outputs include peer-reviewed journal articles, conference papers and datasets of various types. The restrictions to use, commonly imposed by publisher copyright, patents or other mechanisms of control do not apply. IPH in collaboration with the Regional Library, Dr. Steevens Hospital are hosting an Open Access seminar organised as part of Annual International Open Access Week, 21- 27 October 2013. Alternatively email Louise Bradley or call +353 (01) 478 6307. Copyright Â© 2013 For further information contact:.